Create your own prehistoric world. 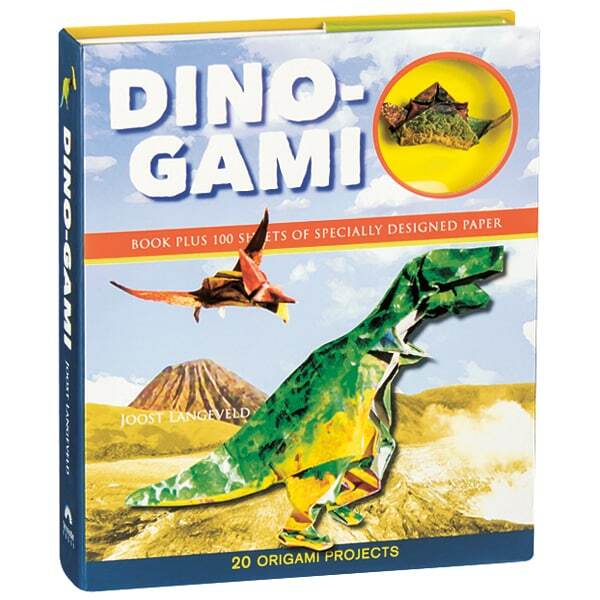 In this companion set to his Horror-Gami, Dutch origami artist Joost Langeveld presents 20 models of dinosaurs and other ancient creatures—some of them simple, some quite challenging—including sail-backed Dimetrodon, spiky Stegosaurus, and long-necked Diplodocus, as well as fliers like Archaeopteryx and Pterodactylus, and all-time favorites T. rex, Triceratops, and Velociraptor. Inside the portfolio you'll also find a sheaf of 100 folding papers (6 inches square), variously printed in 20 different patterns of scales, patches, stripes, and other colorful textures, so you can create a whole herd of dinos.